This unit reviews the foundational concepts that have been covered in prerequisite math courses. Students revisit the definition of a function, function notation, and the key properties of functions. Students also review transformations of functions and inverse functions. The unit assessment evaluates students' ability to carry out proper communication, formatting, and technical skills in their work, all of which will be important aspects of their assignments in the remainder of the course. In this unit students learn to identify and describe some key features of polynomial functions and to make connections between the numeric, graphical, and algebraic representations of polynomial functions. These concepts allow students to manipulate functions in a number of ways and apply their skills to solve real-world problems. Strategies will be employed to aid in the connection to an understanding of rates of change. Students begin this unit by identifying and describing some of the key features of rational functions. Students then learn to represent and manipulate these functions to solve real-life problems, graphically and algebraically. This unit also introduces the idea of inequalities and how they produce different solutions than equations. 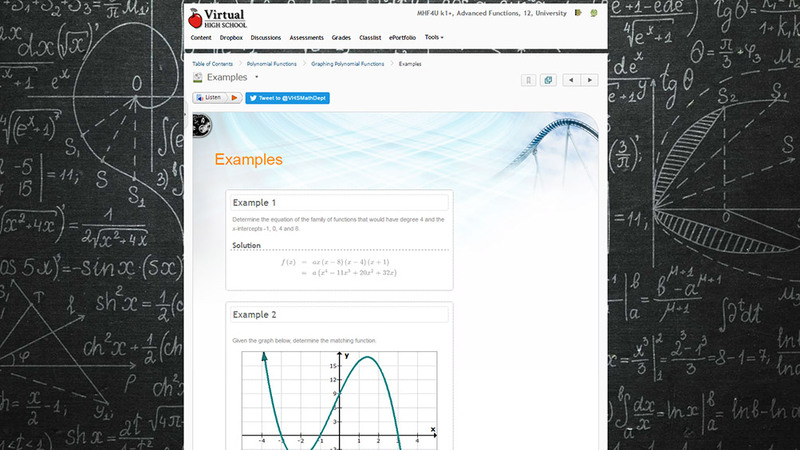 This unit begins with a review of exponential functions, their properties, and applications. This leads into discussions about a related function, the logarithmic function. From here students learn about logarithmic properties and then apply their knowledge of exponential and logarithmic functions to solve real-world problems. This unit examines the meaning and application of radian measure. This allows students to solve more complex situations in exact values. Students will make connections between trigonometric ratios and the graphical and algebraic representations of the corresponding trigonometric functions and use these connections to solve problems involving trigonometric equations and to prove trigonometric identities. This unit develops students understanding of trigonometry by expanding on the functions behind the trigonometric ratios. Students look at trigonometric functions and their reciprocals, examine their key properties and behaviours, and learn how they can be transformed to model a wide range of data. Having studied various types of functions and transformations of functions, and understood the significance of differential rates of change in functions, this final unit focuses on the theory and practice of performing arithmetic operations on entire functions, including but not limited to the algebraic, graphical and practical implications of performing those operations. A3 solve exponential and simple logarithmic equations in one variable algebraically, including those in problems arising from real-world applications. B3 solve problems involving trigonometric equations and prove trigonometric identities. C4 demonstrate an understanding of solving polynomial and simple rational inequalities. D3 compare the characteristics of functions, and solve problems by modelling and reasoning with functions, including problems with solutions that are not accessible by standard algebraic techniques. Communicating: This course offers students many opportunities to share their understanding both in oral as well as written form. Students will discuss concepts they have learned through discussion boards, write reports which relate concepts taught to real-world applications, and create presentations to demonstrate understanding of some concepts. Problem solving: This course scaffolds student learning by building on prior knowledge and skills. Students will have the opportunity to review prior concepts and will be presented with problems that require them to apply their skills in new ways to solve problems related to real-world applications. Selecting Tools and Computational Strategies: This course models the use of graphing software to help solve problems and to familiarize students with technologies that can help make solving problems faster and more accurate. Connecting: Students will connect the concepts taught in the course to real-world applications (e.g. concepts related to polynomial functions will be connected to applications in engineering). Students will have opportunities to connect previous concepts to new concepts through posed problems, investigations, and enrichment activities.